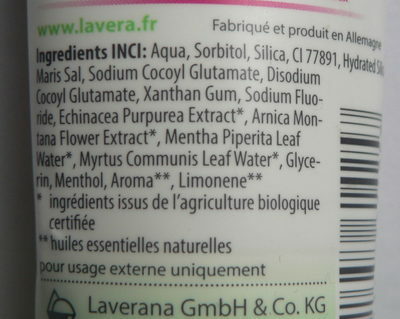 Aqua, Sorbitol, Silica, CI 77891, Hydrated Silica, Maris Sal, Sodium Cococyl Glutamate, Disodium Cocoyl Glutamate, Xanthan Gum, Sodium Fluoride, Echinacea Purpurea Extract*, Arnica Montana Flower extract*, Mentha Piperita Leaf Water*, Myrtus Communis Leaf Water*, Glycerin, Menthol, Aroma**, Limonene**. 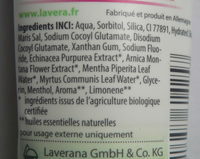 * ingrédients issus de l'agriculture biologique certifiée. 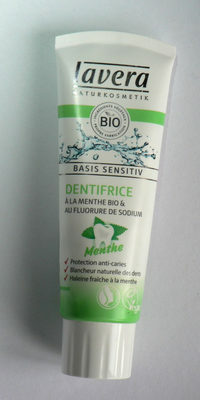 ** huiles essentielles naturelles. Product added on January 31, 2017 at 5:01:23 PM CET by claude-v.
Last edit of product page on October 13, 2018 at 10:08:22 PM CEST by sebleouf. Product page also edited by khorkaadren, openfoodfacts-contributors, tacite.